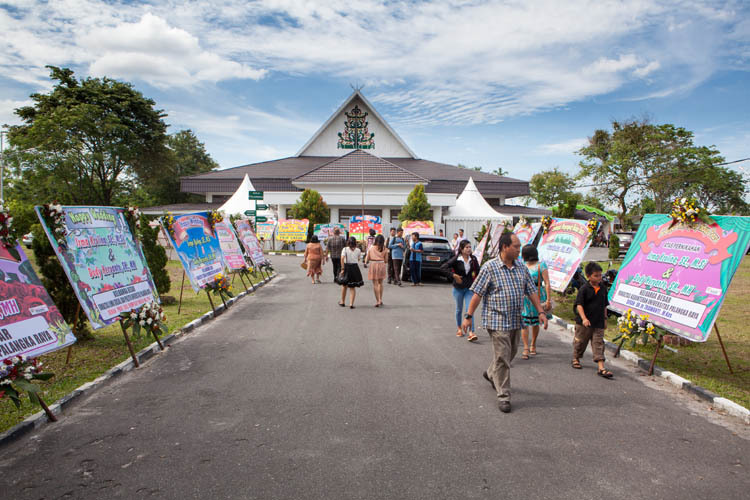 The ‘traditional’ institution of marriage is very much alive and well in Indonesia. Wedding receptions are big happy noisy colourful affairs with crowds and amplified music spilling out onto the street, so it’s impossible to miss them. 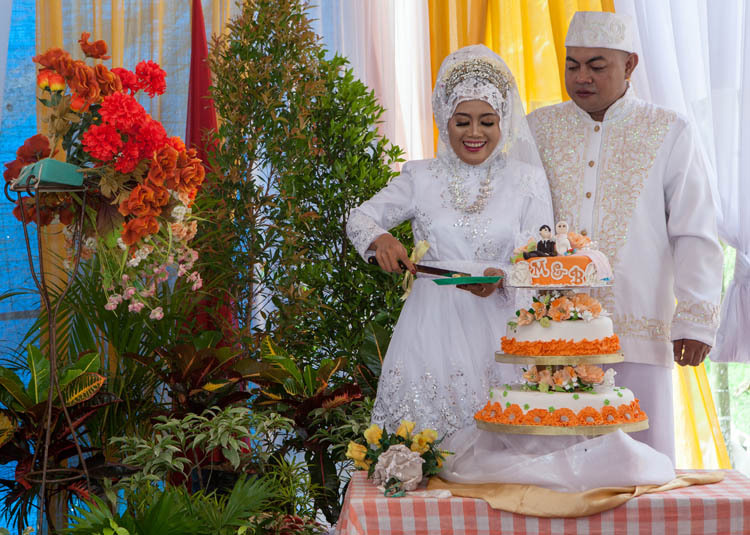 When we were returning to Palangkaraya from Banjarmasin recently (a four hour drive, much of it through sparsely inhabited swamplands) we passed ten wedding celebrations along the way. 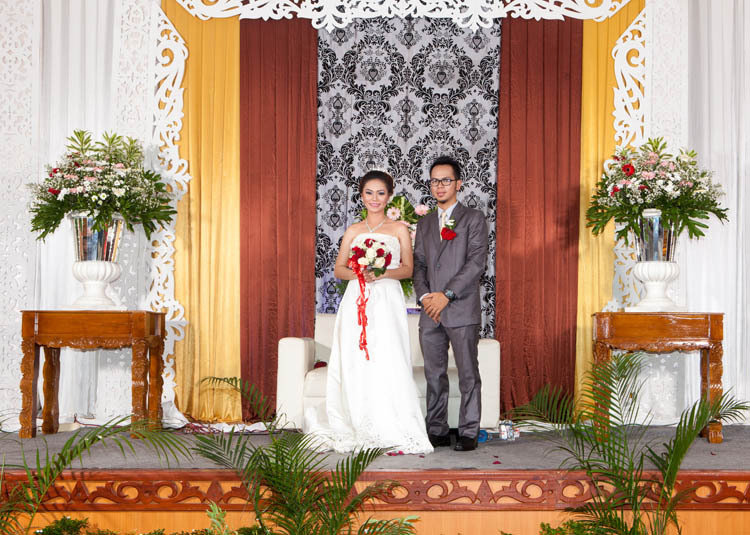 The laws about marriage in Indonesia are interesting. Everyone in Indonesia must be registered as belonging to one of the six authorised religions: Islam, Hinduism, Buddhism, Protestantism, Catholicism or Confucianism. This gets recorded on your national identity card – and agnosticism or atheism are not accepted. There is a prohibition on interfaith marriages; if a Muslim and a Catholic want to marry, for example, one has to convert to the other’s faith. The national law is that the minimum age for marriage is 16 for girls and 19 for boys, but this is often ignored. 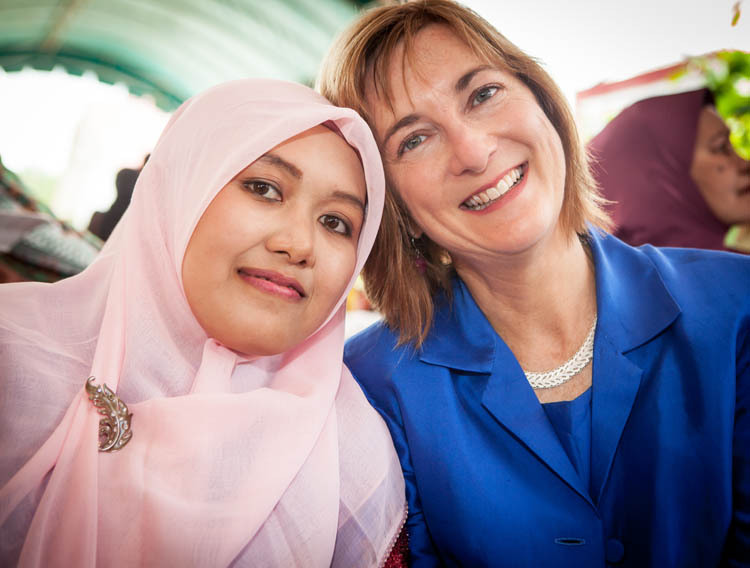 UNICEF has estimated that 3% of Indonesian girls are already married by the age of 15. By law, anyone getting married at 19 or under is required to have written permission from both sets of parents. Having children outside of marriage is not acceptable. In Bali for example, neither mother nor child will be permitted to enter a temple – a significant sanction there! There are three parts to a wedding: the religious ceremony, the official registration, and the celebration or reception. It seems that the social conventions are sort-of the reverse of those in Australia i.e. the ceremony is a small private affair, and the reception is open to just about anyone who shows up. 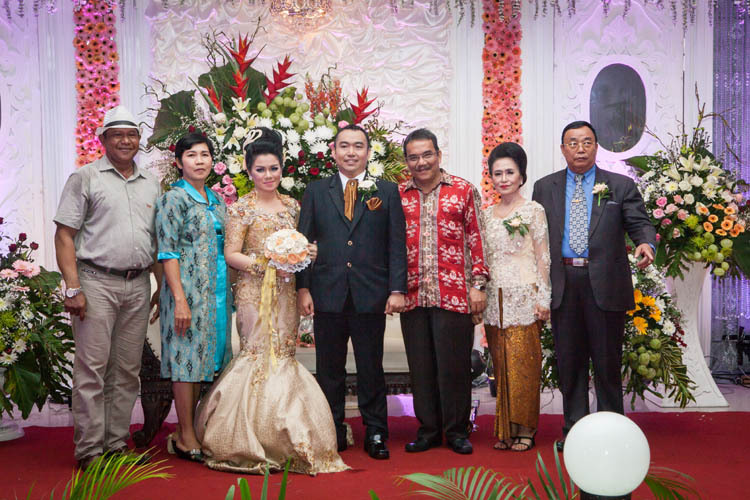 We have now been to six Indonesian wedding receptions, though we only had an invitations to two of them (and in only one case – Katie and Yoyok’s wedding back in 2009 – did we actually know the bride and groom!) Three were Javanese Muslim, one Banjar Muslim, and two Dayak Christian. But at every wedding we have been made to feel like honoured guests – and not at all like the freeloaders that we actually are! In fact at a couple of weddings we have felt like celebrities, and wondered if we were getting photographed more often than the bride and groom! Styles of clothing, food and entertainment vary, but they always have a similar structure. The reception may go on all day (or one case, all night! ), and the guests come, pay their respects to the couple and their families, leave a gift of money, eat a meal, and then leave. People are coming and going all day, some only staying for a matter of minutes. Outside, there may be specially made billboards, festooned with flowers, from well-to-do well-wishers. When you enter, your are greeted by numerous members of both families. They’ll be lined up in two rows, maybe 20 of them, and you run the gauntlet between them to get in. You are expected to shake hands with EVERYBODY, touching your right hand to your heart after each greeting. You sign the guest register, and make sure everyone sees you deposit an envelope of cash into the gift box. Wedding presents are unusual, but a gift of cash, no matter how small, is expected. This helps to defray the significant costs of hosting a wedding. The bride and groom sit enthroned on a dais or stage at one end go the hall or pavilion, possibly with their parents on either side of them. They will be dressed either in traditional wedding costumes – or in western-style white wedding attire. They may go through a couple of changes of clothing during the day. Before any socialising or eating, you go up and congratulate the happy couple, and usually get photographed with them. There may be a queue waiting to pay their respects; at one particularly large wedding, there were hundreds of people lined up at one point waiting their turn. Then it’s down to the serious business of eating. 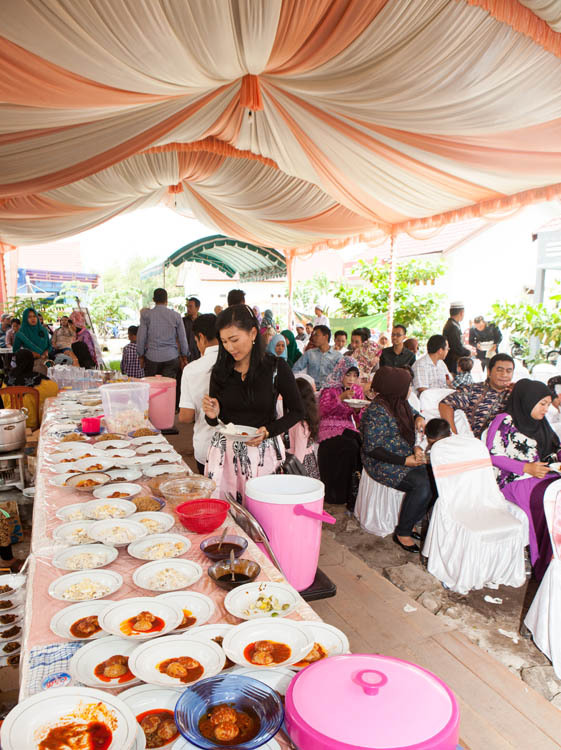 Because there is no set time for the wedding banquet, there are meals lined up ready to eat throughout the day. Good food – and plenty of it. The entertainment will vary. There may be Dayak dancers and music. 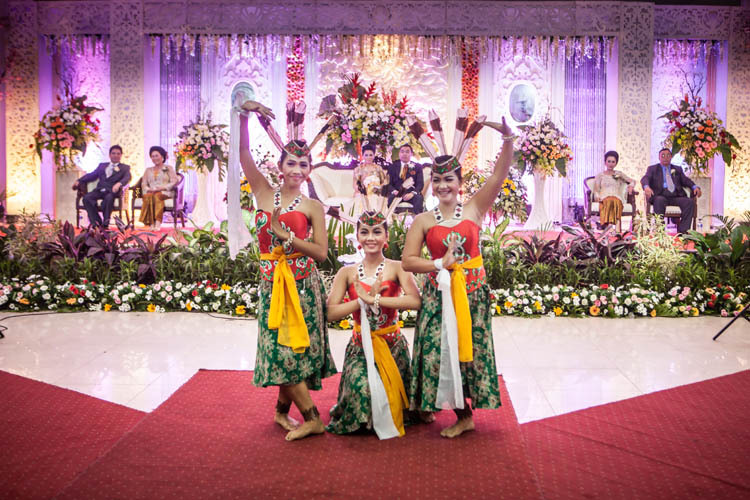 At a Javanese wedding there may be a wayang kulit (shadow puppet) or kuda lumping. Or else, for something more contemporary, that perennial Indonesia favourite: karaoke! A little socialising, a few photographs – and then you leave. The well-known Indonesian expression: “Sudah makan, pulang” (After eating, go home!) applies here. So you run the greeting gauntlet in reverse, shaking hands with and thanking all of the family members on the way out. 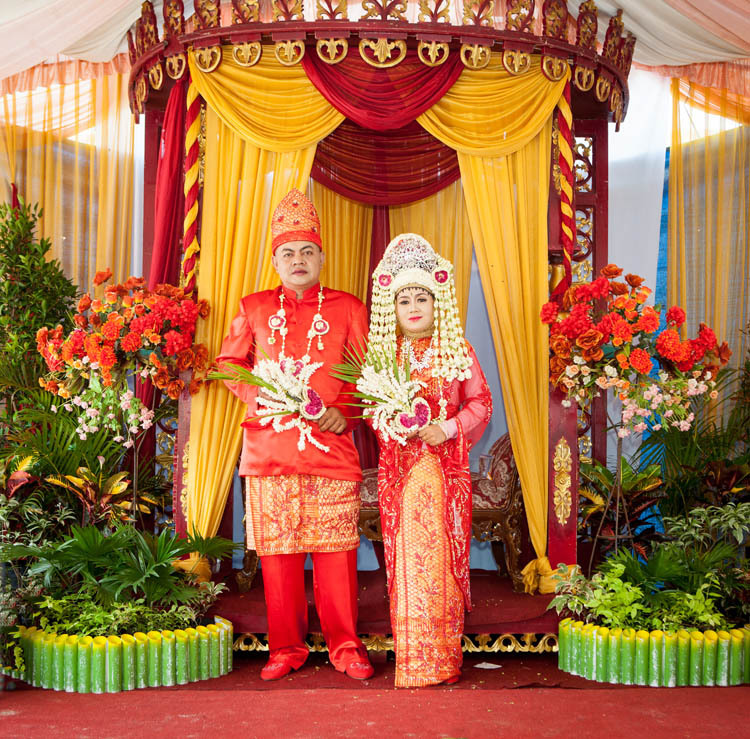 This entry was posted in General and tagged Banjar, Central Kalimantan, Dayak Ngaju, Kalimantan Tengah, Palangkaraya, weddings. Bookmark the permalink.